Spread across the various educational features will be some of the biggest names in the Occupational therapy profession right now. These will Professor Michael Iwama, Dr Jenny Preston MBE, Dr Joanne Fillingham, Gillian Leng, Michael Mandelstam and many, many more. In addition to the clinical experts, those at the top of the product development and research field will also be in attendance, with more than 270+ OT centred suppliers and manufacturers represented across the bustling trade floor. Check out the latest innovations, technologies and materials highlighted on the show floor and take this opportunity to try out new products for yourself! Brand new to The Occupational Therapy Show this year will be the Posture and Wheelchair Essentials Theatre supported by the Posture and Mobility Group (PMG) & National Wheelchair Managers Forum (NWMF). Designed to focus on wheelchair and seating assessments, particularly looking at pressure management, special seating and manual wheelchairs. It will be useful for anyone working regularly with clients requiring wheelchairs or special seating equipment, whether on a permanent basis or for occasional use. So make sure you make time at the show this year to pay this brand new theatre a visit! The Occupational Therapy Show Poster Zone – now open for submissions, so don’t miss out submit your abstract by visiting www.theotshow.com/posterzone. 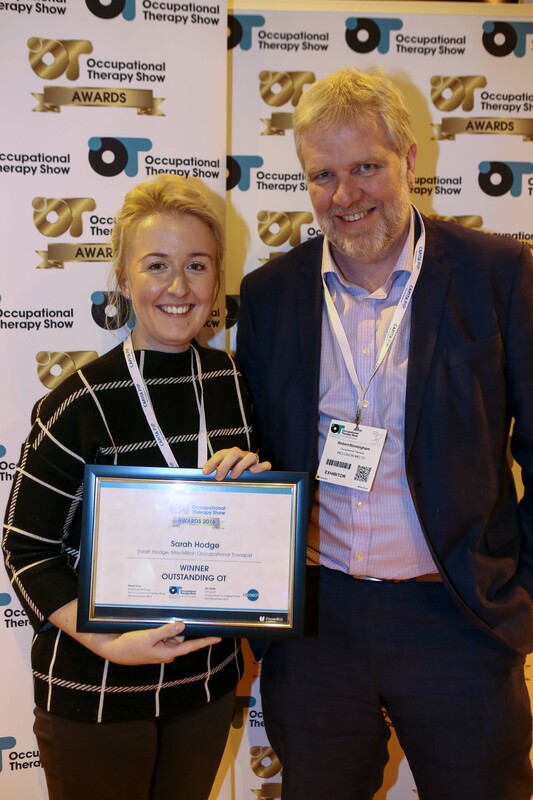 The Occupational Therapy Show Awards – Nominations for the awards are open to all OT professionals, so start submitting your nominations for the awards! The awards are aimed at grass roots OT professionals, whether in the statutory or private sector, to recognise and celebrate outstanding contributions made to both the profession and to the clients they serve. Jen Gash, from OTCoach, will be chairing the 2017 awards and said “there is so much great work happening out there and many OTs work without due recognition or reward. These new awards are a chance to celebrate the work of OTs”. The winner(s) of each award (not per person) will be awarded £250 cash prize, plus a place on OTCoach’s “Coaching Skills for OTs” online course, worth £120! All nominees will receive a special gift from OT Coach! The bestselling e-book “Selling OT: from OT idea to value proposition”. It is just as important to us that you have fun at The Occupational Therapy Show, while learning and developing your skills. More than 4,700 professionals are expected to attend the event, making it the perfect place to meet with your peers at one of the array of social events including the free networking drinks reception and tea and cake afternoon! Register your whole team for FREE today at www.theotshow.com/dbh ! Previous ArticleGet Ready for Naidex 2018!